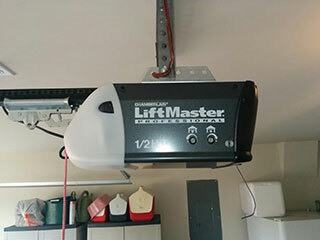 Garage door openers make the automatic function of your system possible, a feature many of us have come to take for granted. When something goes wrong, it can be majorly inconvenient to manually open and close the door each time you need to get your car in and out. Our local specialists in Duluth are on hand to help out with any opener related troubleshooting – we'll inspect the sensors, the motor drives and limit switch for any malfunctions that could be blocking the successful automatic operation of your door. If following our inspection of your system and troubleshooting, it turns out that you're in need of a replacement opener we can help you with this. We will guide you through the choices available and make recommendation based on your needs and the setup of your property. You can also rest assured that any models or replacement parts we provide are from tried and trusted brands only, such as Genie, Chamberlain and Craftsman. We don't mess around when it comes to the safety of your garage door system! The most traditional opener system is the chain drive - the motor moves the chain to lift the door. This type of drive is very strong and durable but can also be very noisy. A better option for attached garages or garages with bedrooms located close by would be a belt drive type. These are designed similarly to chain drive models but their rubber belts make their operation much quieter. Screw drive openers are also an option - they use a threaded steel rod instead of chains or belts and typically come with few moving parts. They have the benefit of being pretty maintenance free but will be a bit louder than a belt drive. Our garage door repair technicians always do their best to provide a same day service and will aim to visit your property at a time that suits you. Regardless of the problem you're experiencing with your unit, call us today for services you can rely on.